This four- to two-lane road redesign in Dallas, TX transformed a high-crime corridor into a walkable, economically vibrant commercial district. Top: Lower Greenville before rightsizing (2018). Bottom: After rightsizing (2018). 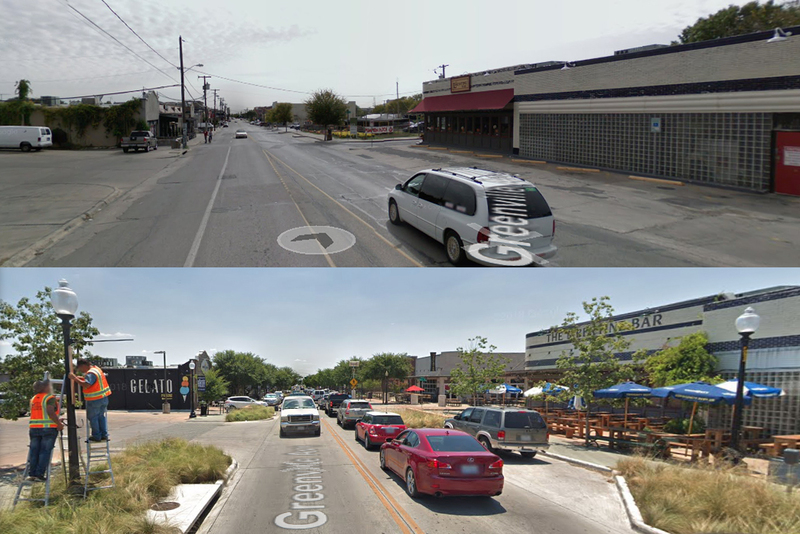 The Lower Greenville rightsizing project in Dallas, TX is an excellent example of a road redesign conducted with a specific purpose in mind: the transformation of a high-crime nightlife district into a more family-friendly, economically vibrant, walkable commercial corridor. In 2010, Councilwoman Angela Hunt and Mayor Pro-Tem Pauline Medrano led a campaign to improve the neighborhood. The reduction of the road from four lanes to two, with doubled on-street parking and vastly-enhanced sidewalks, was central to this effort. After Greenville Avenue was redesigned to focus on creating an environment for people, business followed and development increased by 212% since then. A body of evidence, both statistical and anecdotal, suggest various other benefits, including reduced vehicular speeds, less crime, and less accidents. The variety of businesses, the redesign of wider sidewalks with street buffers, and addition of crosswalks has increased pedestrian activity throughout all times of the hour, consequently, creating a safer pedestrian environment. The transformation of Lower Greenville extended beyond the physical facade, too. A couple of years after Lower Greenville’s road was right-sized, stakeholders got together to form the Lower Greenville Business Association whose mission is "supporting and promoting a positive quality of life in our neighborhood."